First-year Great Bend coach Erin Beck grew up in Claflin, played under legendary coach Gregg Webb in high school, and later at Washburn University. His wife Cindy (Keeley) Beck was a three-sport standout at Great Bend. She set multiple school records before starring for Washburn’s basketball team and helped the Lady Blues to a national title. Garden City coach Brian Hill is in his seventh season as the Buffs’ head football coach following a stint as Garden City Community College’s offensive coordinator. Beck and Hill have longtime ties to the Western Athletic Conference, a five-team league that has remained unchanged for years. On Friday, Great Bend, No. 1 in Class 5A, plays host to Garden City, No. 5 in Class 6A. Both teams are 7-0 and stand 3-0 in the WAC. Under the new structure, top seeds and home field advantage in the playoffs are in play for both squads. Also important, the WAC title goes to the winner, a championship that, unlike some other leagues that have seen significant recent change, still holds great value. “Winning the WAC, and playing against opponents that these kids played against from WKFL, from middle school, to when they are a freshman in high school, and now obviously, it means a lot to these kids,” Beck said. Garden City last won the conference outright in 2013 after a three-way tie with Great Bend, Hays and GC in ’11. Great Bend’s last outright title was 2008. Dodge City in the defending WAC titlist, and Liberal was the juggernaut in the ‘90s. Dodge City has long tracked the Champions Cup, given to the WAC team with highest aggregate finishes in all the sports the conference offers. Great Bend, 7-3 last season, have bumped to the top of the poll for the first time this week behind the No. 2 offense in the classification with 316 points. Beck coached at Great Bend for three years as an assistant before serving as defensive coordinator at Truman (Mo.) High School under Webb for two seasons. He was named the new Panther coach in March after Tony Crough left for Andover. From 2014-16, Kansas has had 188 new high school football coaches, according to kansasprepfootball.com archives. Those coaches have won 38 percent of their games in their initial season. In ’14-15, only three first-year coaches posted an undefeated regular season, all in Class 2A or eight-man. This season, Beck and Osborne coach Cullen Riner – in his second head coaching stint at the school – are the only first-year head coaches who haven’t lost. “It all goes back to the kids,” Beck said. “We have a great group of senior leaders and some younger kids that have really stepped up, but this situation, I couldn’t ask for a better one. Senior quarterback Jacob Murray has completed 93 of 137 passes for 1,238 yards and 14 scores against one interception. As well, he has rushed for 972 yards and is tied with Garden City senior quarterback Jesse Nunez for the conference lead with 19 rushing touchdowns. Nunez, who has started under center since he was a sophomore, has 153 carries for 1,013 yards. He has completed 61 of 120 passes for 843 yards with an 8/4 TD/INT ratio. Garden City averages 39 points and 381 yards a game. Hill, a former high school and college quarterback, coached quarterbacks at Hutchinson CC and Garden City CC, including longtime pro Shaun Hill at Hutchinson. He has produced four standout quarterbacks – Cody Bernbeck, Jake Curran, Greyson Tempel and Nunez – in his seven seasons as head coach. Hill said “armchair quarterbacks” will often ask him about Nunez’s passing ability. A state champion wrestler, Nunez is a very skilled, tough north/south runner and is 15-2 in his last 17 games as a starter. Career-wise, he has 2,435 passing and 2,453 rushing yards with 62 touchdowns accounted for. In the Hill era, Nunez is the first quarterback product of the Garden City pipeline that starts in middle school. Senior Peyton Hill (475 rushing yards) has returned from a shoulder injury and keyed the last two wins against Wichita Northwest and Dodge City, the only two squads to beat the Buffs last fall. Last week, Garden City earned a 36-13 road win versus rival Dodge City in the Hatchet Game. The Panthers had seven defensive scores in 2015, including an 11-man state record four fumble recovery TDs that broke a 31-year-old state record held by Burlington, according to the Kansas Sports Hall of Fame. Through seven games last season, the Panther defense allowed 25.4 points and 288 yards a contest. This year, Great Bend’s defense has permitted 324 yards but just 20 points a contest. “That’s OK to give up three yards here, four yards there, but to make a team drive it on us, we feel like we can put together some stops and create some havoc,” Beck said. Senior linebacker Payton Mauler broke the Panthers’ career record for tackles earlier this fall. He leads the conference with 109 stops after tallied 117 as a junior. When Beck first came to Great Bend, he believed there was “no way” Mauler was collecting 15 to 17 tackles a game. Then, Beck watched film and noted statistics the first couple of weeks with his defensive coordinator. Mauler, an avid film watcher, picks up little tendencies, avoids blocks, reads and reacts well. Two seniors, linebacker Jensen Randall (67 stops) and lineman Dominique Rideaux (46 tackles), have led the defense along with Mauler. Freshman Dalton Miller has emerged as the starting free safety and averages 9.6 tackles a game. “In on every tackle with Peyton,” Beck said. Cody Carlson played for Webb at Eudora, and then was a first team All-American offensive lineman on a national championship squad for Northwest Missouri State University. Carlson joined the staff at Truman with Webb before coming to Great Bend with Beck. Great Bend’s line returned just two starters in junior right tackle Aaron Clark (6-7, 290) and senior left tackle Noah Presson (6-5, 280). The rest of the line features sophomore center Kaden Schroeder (5-9, 250), sophomore right guard Payton Doll (5-11, 190) and junior left guard Trevor Fehr (5-11, 195). Beck and Carlson have incorporated some of Webb’s gap-style, misdirection running game with a trapping or pulling guard. Carlson has helped Great Bend’s younger line learn angles and leverage. 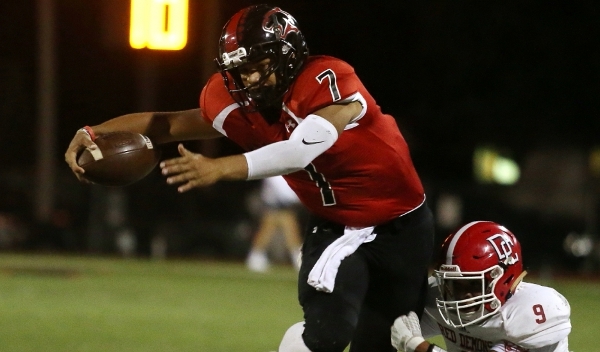 Through seven games last season, Great Bend averaged 30 points and 326 yards a game. This year, those averages have increased to 45 points and 454 yards a contest. Senior Bryce Lytle is the WAC’s leading receiver with 47 catches for 650 yards and seven scores. Senior Brayden Smith and sophomore Koy Brack are threats at wide receiver, and senior Cal Marshall has 776 rushing yards. “A lot of credit is to our offensive line,” Beck said. Garden City is significantly larger than Great Bend; Beck called the Buffs the biggest team the Panthers have seen. Junior DeMarcus Elliott (6-4, 286) has 12 TFLs. Senior linebacker Zeke Herrera paces the Buffs with 73 tackles, two pick-sixes and is the team’s kicker. Last week, because of illness to senior tight end Lincoln Biera, Herrera stepped in and caught two passes for 68 yards and a score, the first two catches of his career.